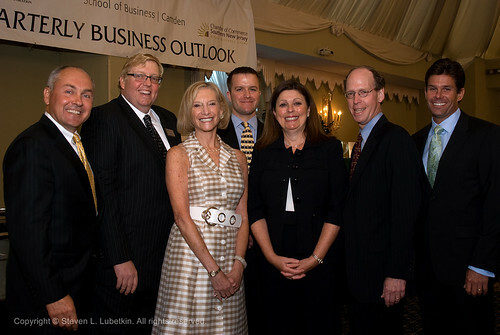 Rutgers University Camden hosted its Quarterly Business Outlook panel in Cherry Hill on July 20. Four panelists from different industry sectors gave their views on the economy. Tilley1: Outlook is for growth going forward in activity and employment. Tilley2: The credit situation remains difficult for banks and for borrowers. [00:22] OUTCUE: …past couple months. Sowa1: The commercial real estate industry is starting to stabilize. Sowa2: Smaller borrowers are still having a hard time getting credit. Sowa3: Confidence in the outlook means tenants are looking for longer leases in commercial buildings. [00:23] OUTCUE: …in some sectors. Charbeneau1: People need to have cultural and recreational activities and will be looking for more cost-effective options for family vacations. [00:29] OUTCUE: …how they go about doing things. Charbeneau2: Travel and tourism industry will remain strong, and business travellers will be a leading indicator of economic recovery. [00:33] OUTCUE: … especially in 2011. Mr. Morr attended the QBO and offered his perspectives on why the Delaware Valley region is attractive for businesses considering relocation. [00:25] OUTCUE: …about the future. Morr2: Morr describes the kinds of industries that flourish in the Philadelphia region. Morr3: Morr explains why companies should want to be in the Northeast. [00:35] OUTCUE: …in annual economic output.